Australian water utility Yarra Valley Water, Melbourne’s largest retail water business, created AU$72.4 million of benefits for the environment, its employees and society in 2014/15, according to the first ever integrated profit and loss (IP&L) account published in the water sector. The IP&L was developed in partnership with international environmental data experts Trucost and sustainability consultancy GIST Advisory. The IP&L is a new way for companies to holistically understand and report their environmental, social, employment and financial performance to investors, customers, government and regulators. With increasing concern worldwide over climate change, water scarcity and corporate profits, there is a growing consensus that it is no longer enough for companies simply to measure their financial performance. The decision to publish an IP&L – the first in the global water sector – was driven by Yarra Valley Water’s desire to demonstrate the full value it delivers to society. Yarra Valley Water has committed to being a restorative company by creating more value for society than it consumes. Yarra Valley Water will use the IP&L to improve strategic decision making. This will enable the organisation to prioritise projects that will deliver improved value to its customers and community, having included a more holistic analysis of social and environmental impacts and benefits. These projects include investigating integrated water management opportunities to service population growth which is forecast to double over the next 50 years, its role in community health, and the degree to which it can integrate renewable energy generation such as waste-to-energy into its business. Not only does the IP&L help deliver more holistic value, it enables working with different stakeholders to achieve outcomes previously not possible. Like many other organisations, Yarra Valley Water’s financial analysis historically only considered technological upgrades to its sewage treatment plants to meet environmental regulatory discharge limits. Now it is exploring how it can deliver better outcomes for local people by working with land owners to protect ecosystems in upstream areas. 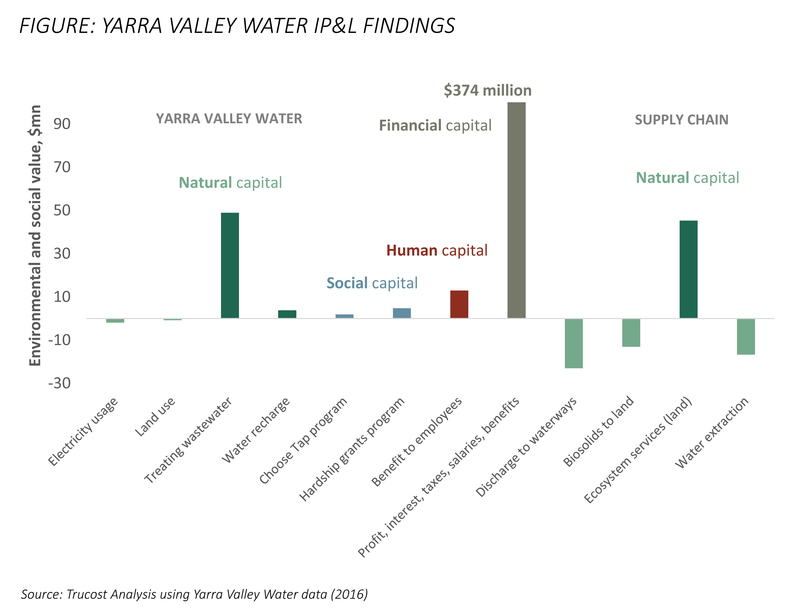 The IP&L is based on an analysis by Trucost and GIST of Yarra Valley Water’s positive and negative impacts upon natural, social, employee and financial capital. Just like financial capital, companies depend on the environment, society and employees for the success of their businesses. The impacts are quantified in monetary terms, allowing them to be measured and managed in a clearer and more effective way. On the positive side of its IP&L, Yarra Valley Water created environmental benefits worth AU$53 million in 2014/15 primarily due to its wastewater treatment operations which remove pollutants from sewage and effluent from industry. Yarra Valley Water also created employee benefits worth AU$13 million through activities like training, and social benefits of AU$6.4 million through its program to provide water services to vulnerable households. In total, Yarra Valley Water’s environmental, social and employee benefits add up to AU$72.4 million in 2014/15. The financial value added by Yarra Valley Water to the Australian economy in 2014/15 was AU$374 million. Yarra Valley Water’s environmental impacts, which cost AU$3.8 million in 2014/15, are primarily due to greenhouse gas emissions from electricity and fuel use, and disposing of waste to landfill. The results of the IP&L show that the organisation’s net contribution far exceeds its negative impacts. The IP&L has given Yarra Valley Water new insight into sustainability by highlighting water extraction in its supply chain as an issue that needs further consideration. The IP&L will be useful in guiding discussions between water companies, government, regulators and customers over the fundamental importance of water to business and society, and whether this is reflected in how it is used and valued at present. Pavan Sukhdev, Chief Executive Officer of GIST Advisory, said: “I am most encouraged to see that Yarra Valley Water has undertaken a 360-degree analysis of its stakeholder impacts: financial, environmental,social and human. I believe Yarra Valley Water is the first water utility to do so, and it sets a fine example for other public utilities around the world to follow. After all, societal wellbeing is their defining purpose, and how can one know how well a utility is achieving that purpose without measuring stakeholder performance?" Trucost helps companies and investors to achieve success by understanding environmental issues in business terms. Our data-driven insights enable organizations to manage risks and identify opportunities for growth. We are the world’s leading experts in quantifying and valuing the environmental impacts of operations, supply chains, products and financial assets. By putting a monetary value on pollution and resource use, we integrate natural capital into business and investment decisions. With offices in Europe, the US and Asia, Trucost works with businesses worldwide to increase revenues, improve communications, meet marketplace expectations and comply with regulatory requirements. GIST Advisory provides sustainability consultancy services to enable governments, corporations, civil society organizations, banks and financial institutions to discover, measure, value and manage their impacts on natural capital, social capital, human capital non-shareholder financial value addition. Our framework helps companies to become future ready by measuring corporate performance from a wider ‘stakeholder’ perspective, helping companies to look beyond revenue and share price to broader dimensions of public wealth that are critical for a sustainable economy. Our goal is to help maximize the effectiveness, efficiency and sustainability of government policy, corporate strategy and financial investment.